According to the Sanya Traffic Police Department and the construction organization, the reconstructed "Sanfu” bridge deck of Xinfeng Bridge will be completed at the end of March, and is scheduled to open to traffic on trail run starting 1st April, 2012. The reconstructed project covers about 530 meters long broaden to two-way 6 lanes, a non-motor vehicle carriage way and a sidewalk are added on both sides of the 224.02-meter-long bridge. In addition, the lanes of the jointly entrance of Xinfeng Bridge and Hedong Road & Hexi Road have been broaden to 7 lanes instead of 4 lanes. 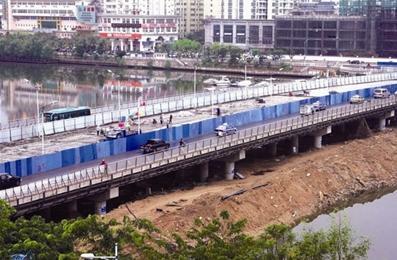 After the trial operation, the newly-constructed Xinfeng Bridge will be open to traffic officially starting 1st May, 2012, which will greatly ease the traffic jam at Xinfeng Street.